The previous tutorial (first half) explained how to download a speedometer picture from www.flickr.com and how to alter it (delete the needle) using a freeware called Gimp (similar to Photoshop). – The model replaces the deleted needle from the picture with a moving one created from a chart line. 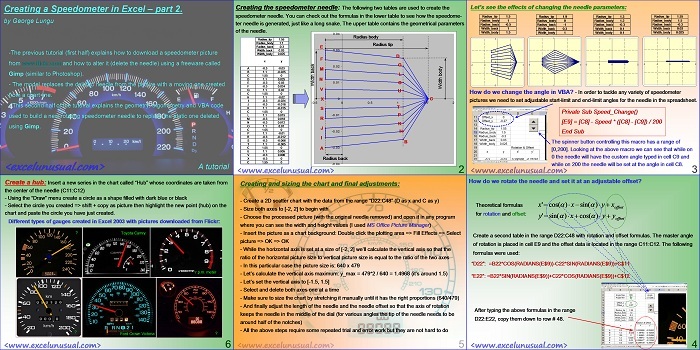 – This second half of the tutorial explains the geometry, trigonometry and VBA code used to build a new rotating speedometer needle to replace the static one deleted using Gimp. was waiting since i saw the cockpit reporting in ajax…. waiting to implement at my work…. As you mentioned the formula below is the parametric circle formula. Strictly speaking the excel formula that you wrote on above has a=0, b=0 (you can modify that if you wish) but there are two different scale factors you can choose (B22, C22) and they are adjusted function of the size of the clock face you paste in. Normally B22 should be equal to C22 and equal to the clock arm length, but if you choose a clock which is non-square (rectangular for instance) you could have the clock arm ends move on ellipses rather than circles. Thanks Kamal! I agree with you on this one. I either remember the easy ones or I go to Wikipedia for some help. My parents were both high school teachers so I was sometimes forced to spend more time with formulae than with my hobbies. Of course the copy-paste strategy is the best when is not too laborious. George I am jealous , being human to remember all those trigonometrical formulae and macros.. 😛 copy paste is always best strategy , untill it has got copy rights.